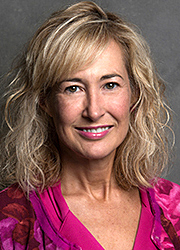 Professor Marie Hardin was named dean of the College of Communications in July 2014. She joined Penn State's faculty in 2003, and previously served as associate dean for undergraduate and graduate education, capping levels of responsibility that grew regularly during her tenure at the University. In 2009, Hardin was one of four Penn State faculty recipients of the University-wide George W. Atherton Award for Excellence in Teaching. She also was appointed the College of Communications’ associate dean for administration. Hardin was promoted to associate dean for graduate studies and research in 2010, and that same year she was named a finalist for the Scripps Howard Foundation Journalism and Mass Communication Teacher of the Year. In the College, she has also held leadership roles with the College's Arthur W. Page Center for Integrity in Public Communication and the John Curley Center for Sports Journalism. During the 2010-2011 academic year Hardin was appointed an academic leadership fellow with the Committee on Institutional Cooperation, the academic counterpart to the Big Ten. In 2011 she was elevated to associate dean for undergraduate and graduate education. Hardin joined Penn State’s faculty in 2003 after teaching at Florida Southern College and the State University of West Georgia, respectively. She received her doctoral degree in 1998 from the University of Georgia and previously worked as a newspaper reporter and editor and as a freelance magazine writer. She is vice chair of the national committee for the Accrediting Council on Education in Journalism and Mass Communications. In 2017, she became president-elect of the Association for Education in Journalism and Mass Communication, and moved to president of that organization in 2018. Hardin’s research has focused on issues of diversity, ethics and professionalism in sports journalism. She is author of more than 80 journal articles and book chapters and is co-editor of a book on sports and digital media, published by Routledge. In 2013 The University of Georgia Grady College of Journalism and Mass Communication named her a distinguished alumni scholar. Hardin has taught classes that focus on sports and society at the undergraduate and graduate levels. As dean, she has taught a large-enrollment first-year class that focuses on personal branding and career preparation. In the age of 'enemy of the people' rhetoric, do young people still want to be journalists? Why don't people watch women's sports?